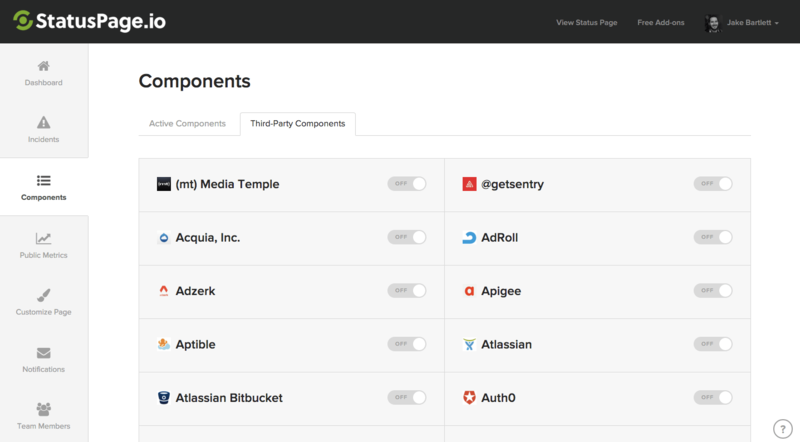 Third-party components are components that you can add to your page that reflect the status of external services. If your service is heavily dependent on a third-party component, you can add the component to your page and the status of that component will automatically be updated. Head over to the Third-Party Components tab within the Components page and you should see a listing of all of the external services we currently have status information for. Once you find your service, click the toggle to display the individual components within the given service. For example, since Statuspage uses Mailgun for outgoing email notifications, we'll activate the 'Outbound Delivery' component from Mailgun's status page. Once the component had been activated, you may want to edit the name and description to something more end user friendly. We'll change the name of our Mailgun component from 'Outbound Delivery' to 'Email Notifications' and also add in a short description. My Third-Party Component Is Down, What Happens? The integration is fairly simple. Depending on the status we parse or have from the external service's status page, we will auto-degrade your third-party component accordingly. For example, if Mailgun is reporting Degraded Performance for Outbound Delivery, we'll auto-degrade the component on your page as well. Once Mailgun switches their status back to Operational, we'll auto-update your third-party component status back to Operational. We do not send any notifications for third-party status changes to your subscribers. If a particular activated third-party component incident does not affect your own services or if the external service has not yet updated their status page during an outage, you can override the status of the component on the Edit Component screen by checking the Override checkbox and selecting the appropriate status from the status dropdown. Once selected, click the Save Component button to save your changes. The component will stay overridden until it's set back to use the official third-party component status by deselecting the Override checkbox and clicking the Save Component button.